The gameplay demo starts stating this is actual footage from pre-alpha software. The background story states it is 2014 and the Coalition forces have teamed up with US Marines to provide stability on the Iraq and Iran border. Clearly the graphics are amazing as your character steps out of the APC. We get chatter from Marine Sergeant Henry "Black" Blackburn of the First Division ,and later get briefed by a field general near a map table. The developers are clearly trying to compete with the Call of Duty franchise by making the single player game feel epic yet scripted. Notice the earthquake shaking inside the building which reminds me of Crysis' tremors. In this video, the HUD constantly tells you to "Follow" your squad leader to the next objective. Of course this is needed to trigger scripted events like doors being opened or the guy being sniped near the end of the trailer. The trailer briefly shows a quicktime event at about 1:50 where the player has to push "S" multiple times to drag the person to safety. The gunplay feels directly lifted from prior FPS games with the player aiming down the ironsight while sneaking back into cover during his reload. Enemies of course never really do any damage to the main character since during these types of videos, game developers put the AI accuracy to something like 20% or make the player invincible. I had to chuckle to myself when a soldier yells "RPG" and the player takes cover next to a vehicle which gets hit by the RPG. If I tried to do this in the single player campaign, I doubt any of my squadmates could "revive" my incinerated chunks. Well it's obvious I will be getting this game for PC when it comes out. I especially want to see Karkand, Wake Island and Gulf of Omar in their new destructible debut. If people are getting this Battlefield 3 for consoles, don't expect to get these beautiful graphics. No doubt DICE was running this gameplay on the highest level PC available. 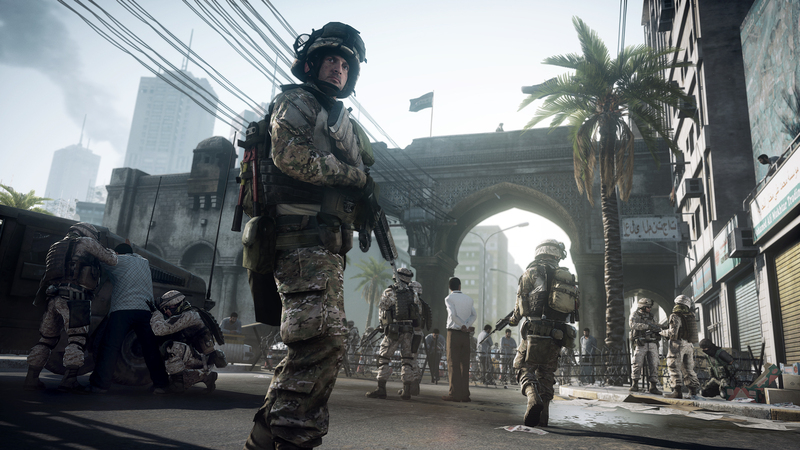 With the same 64 player multiplayer, servers and creative mods, the PC version will always be the definite version for fans who have been playing the series since Battlefield 1942.